SUBHEAD: The Google corporate code of conduct has been modified. It's no longer "Don't be Evil". 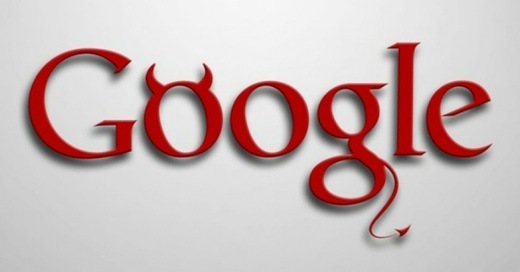 Image above: Illustration of Google as Evil. From original article. I guess the cognitive dissonance between working on drone weapons-targeting systems and the quaint notice of 'don't be evil' got too loud at Google. Is Google finally embracing its evil side? The company has reportedly stripped from its employee code of conduct a section outlining its longtime unofficial motto, "Don't be evil," provoking a swift reaction on social media: "File under: 'Evil is fine now.'" "Glad this question has been settled!" "Google has finally done what was inevitable—abandoned informal commitment to its founding principle." When the company restructured in 2015, Alphabet—Google's new parent company—was widely condemned for its watered down replacement, "Do the right thing," but Google's maintained the "Don't be evil" language in its official code of conduct. That all changed "sometime in late April or early May," Gizmodo reported Friday, after reviewing archives on the Wayback Machine. "Don't be evil." Googlers generally apply those words to how we serve our users. But "Don't be evil" is much more than that. Yes, it's about providing our users unbiased access to information, focusing on their needs and giving them the best products and services that we can. But it's also about doing the right thing more generally—following the law, acting honorably, and treating co-workers with courtesy and respect. So please do read the Code and Google's values, and follow both in spirit and letter, always bearing in mind that each of us has a personal responsibility to incorporate, and to encourage other Googlers to incorporate, the principles of the Code and values into our work. And if you have a question or ever think that one of your fellow Googlers or the company as a whole may be falling short of our commitment, don’t be silent. We want—and need—to hear from you. "Despite this significant change, Google's code of conduct says it has not been updated since April 5, 2018," Gizmodo noted. Additionally, the last sentence of the code is still "And remember... don't be evil, and if you see something that you think isn't right—speak up! "—but without any further context on the phrase and its history at the company. Critics of Google have long used the phrase as a rallying cry to challenge practices and policies that strike them as "evil," from concerns about what the company does with users' personal data to its increasing contract wrokg with the U.S. military. The report about Google's apparent decision to ditch the phrase as a foundational corporate principle was followed by a segment on CBS's "60 Minutes" Sunday that sought to answer the question, "How did Google get so big?" and explore the implications of its power, both for users and other tech companies. As Silicon Valley antitrust lawyer Gary Reback explained, "Google is so dominant in search and search advertising that analysts and venture capitalists in Silicon Valley say it's extremely difficult for startups to get funding if their business model requires them to compete with Google for ad revenue." "If I were starting out today, I would have no shot of building Yelp. That opportunity has been closed off by Google and their approach," said Yelp founder Jeremy Stoppelman. "Because if you provide great content in one of these categories that is lucrative to Google, and seen as potentially threatening, they will snuff you out." Beyond the consequences for small and startup businesses in the tech industry, there's also an impact on Google users, and internet users more broadly. As Reback put it: "People tell their search engines things they wouldn't even tell their wives. I mean, it's a very powerful and yet very intimate technology. And that gives the company that controls it a mind-boggling degree of control over our entire society."